The entrepreneur is also dreaming of rolling out a coffee shop overseas someday. COLIN HARMON, THE founder of coffee group 3fe, is writing a follow-up to his debut book on the café industry after launching several translations of the first title. Two years ago, Harmon self-published What I Know About Running Coffee Shops, a business book that started as a college assignment when he enrolled in a master’s course in innovation, entrepreneurship and design at UCD’s Smurfit business school. The warts-and-all tome – which retails at €30 – has sold roughly 16,000 copies and includes a mixture of anecdotes and advice for people who are considering setting up their own coffee business or have an interest in the industry. What I Know About Running Coffee Shops has been translated into Russian and will soon be available in Indonesian, Japanese and Icelandic – markets where “speciality coffee drinking is thriving” among native speakers, Harmon told Fora. “I’m keen to get a Spanish one as well,” he said, adding that he intends to distribute the title in South America via e-book. The follow-up Harmon is writing will include “more elements of expansion and actually growing up a bit” and will be aimed at an audience of existing café owners. “It’s for people who need some advice or are struggling … There’s a real lack of literature in the segment – although I don’t know if I’d call it literature,” he said. Harmon – who has enlisted a London-based agent to help with his literary ambitions – described the first self-funded book as “probably the most successful thing I’ve done financially” and said the marketing of the title came “very naturally and organically”. Existing buyers of 3fe wholesale coffee and various champions of the business – which has a strong following on social media – helped get What I Know About Running Coffee Shops on the shelves of various independent cafes and other outlets. “There has been no media campaign, I don’t have a PR company. It’s literally just Instagram and Twitter. It’s strange, but I couldn’t get it into (traditional) book shops in Ireland. One I spoke to didn’t get back to me and another one said there was no market for it,” he said. 3fe – which stands for Third Floor Espresso and celebrates its 10th year in business this December – is arguably one of Ireland’s most respected coffee brands. It was recently given the ‘outstanding organisation’ award by the Irish Food Writers’ Guild. The company was founded in 2009 after Harmon left a career in finance to compete in the World Barista Championships. He built a replica of the competition stage in his third-floor apartment – hence the name – and finished fourth the first year he competed. After starting life in the former Twisted Pepper on Abbey Street, now called Wigwam, the business today operates two 3fe shops, sister cafes Five Points and Daniel – the latter of which will soon close for refurbishment – and a restaurant called Gertrude. The company also runs a subscription service, an online shop, a coffee wholesale business, and it hosts a series of workshops on making the perfect brew. The wholesale unit originally sold coffee to Irish hotels, offices, cafes and other businesses but also started selling overseas in 2017 and now exports to 30 markets. According to a return at the Companies Registration Office, 3fe Coffee Limited recently secured €250,000 in funding, with backing from family, friends and hospitality and festival firm Bodytonic. Harmon said the money will be used to take the pressure off Gertrude on Pearse Street, which opened later than expected in December after experiencing a delay. It took longer than expected to secure a fire certificate as the restaurant required a rebuilt staircase because the old one wasn’t health and safety compliant. “We couldn’t shift the stairs, so we had to build a whole new staircase. It slowed things down … It was a big learning curve for me. That’s the way it is,” he said. Harmon said that the funding also allows 3fe to bring on board “people who were incremental in the business” in an advisory capacity, including his father. “There are lots of companies in Ireland that constantly see raising money as the goal,” he said. Harmon said he has received multiple offers to buy the business but “always resisted it”. “I don’t know what I’d do with the money or what I’d do with myself. Unless someone came out with a stupid offer, I wouldn’t sell,” he said. 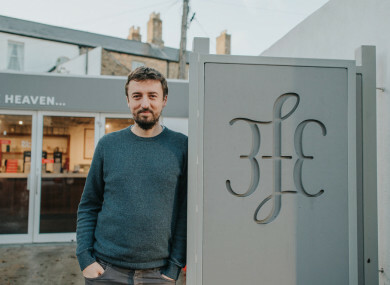 When asked about his other ambitions for the business, Harmon said that in the future, he hopes to open 3fe coffee shops outside of Dublin and overseas – but is focused on running the five existing outlets for now. He name-checked Galway and his birthplace Cork as potential future locations. “I have a real grá for Limerick as well. My wife did her master’s there. I really love the town,” he said. Email “3fe coffee guru Colin Harmon is writing book number two after opening cafe number five”. Feedback on “3fe coffee guru Colin Harmon is writing book number two after opening cafe number five”.